And here is my take on the sketch. I used the leftovers from the Simply Obsessed October Kit. I love, love, love that kit. CC Earth Love is one of my faves! And there is a DT call going on over there now. It is such a fun place to be on the DT for. Everyone who is interested should try out! All the information for the DT call can be found here. The sun is shining, my baby girl is playing and I am on spring break! It doesn't get better than this! The weather is supposed to be nice this week and we have lots of fun plans. I can't wait! It also means I will have lots of pictures to scrap (hehe!). Frances loves to be outside now. In fact as soon as I get home from work she is crying to go outside. We play and play and then when we come inside to make dinner she keeps handing me her coat to go outside again. She likes to look for birds outside. She points to all the birds she sees. I can't believe how much she knows now. Just last year she was still a little baby. Boy how times flies huh? I love the tree on this card. 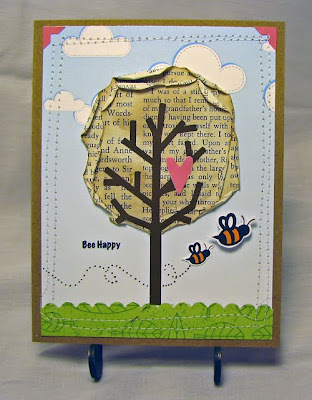 I cut the circles from an old book, inked them, stamped them and layered them to make my tree top. Add the Nikki Sivils tree branch sticker and you have this adorable tree. 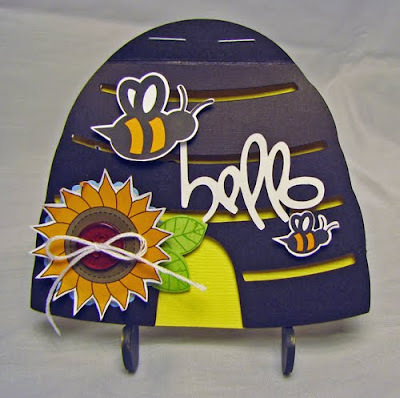 For this card I cut the beehive with my cricut and then stapled it together to make a card. The inside says "honey". Get it? Hello honey? Because it's a beehive! Thanks for stopping by. I have some fun news to share so I am planning a give away soon! Oppps, crazy day yesterday so I am a little late posting this week's sketch from Scrapbook Challenges. Here it is! Even the Nikki Sivils packaging is adorable. Just check out the journaling card here. I cut that from the back of the buttons package! Here's those cute tags and buttons I was talking about! Love, love, love them!! SO's April kit is now on sale! 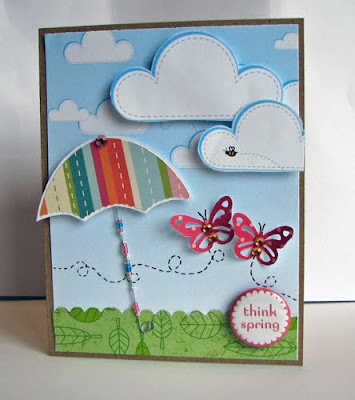 It is just the cutest kit and perfect for spring. Don't you just love the new October Afternoon? I know I do! 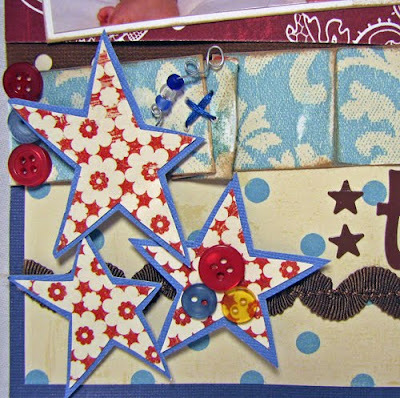 A new week brings new challenges at Scrapbook Challenges!! This week's sketch is a two-pager designed by the very talented Pamela Young. And I just received an email today from the super nice Nikki Sivils herself. 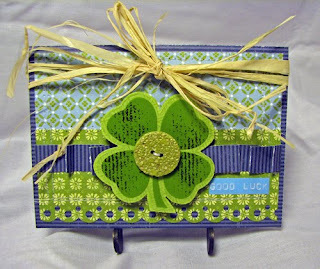 There was a mix up on the blog yesterday and my projects will be posted on March 21st. Oh the agony of waiting another week!!!! I kept stalking the blog yesterday (hehe). 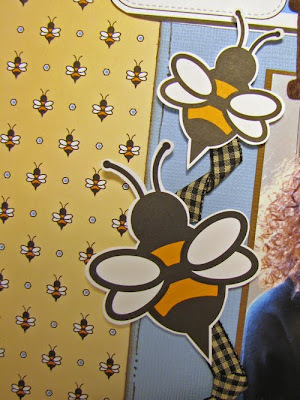 The willow bee collection is one of my favorite lines ever and my projects are my favorites. I can't wait to share them!!! And in other news Chicken Pox has made its way to Frances's school. We are crossing our fingers that she doesn't get it! We have a lot planned for spring break and staying home with chicken pox isn't part of the plan. Have a great St. Patty's day tomorrow. I will be eating some corned beef and cabbage and drinking a green river. Yummy!!!! 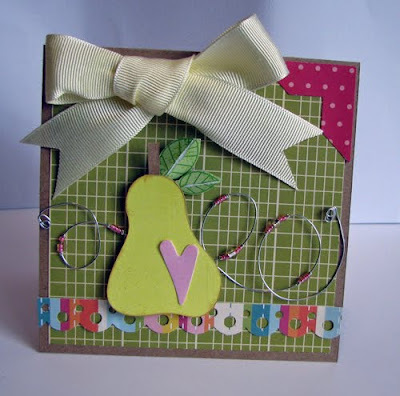 Is my March challenge over at Simply Obsessed. 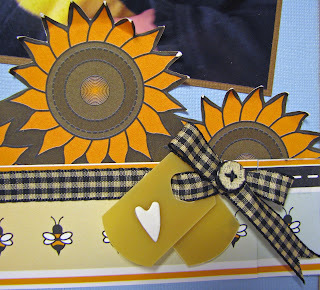 I love the look of those cute little banners I see all over on layouts and cards. Perfect for a birthday celebration layout, right? Exactly what I thought! 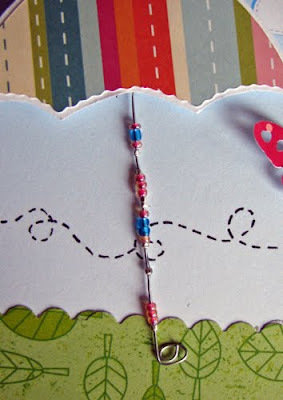 So I created this little banner from scrap patterned paper and raffia. I can't get enough of the raffia right now. I have been putting it on everything! I decorated the banner with flowers and hearts and then birthday candles. I even attempted to put the title on the little flags. In the end I decided the banner looked cute just as is. I guess some times simple is the best way to go. 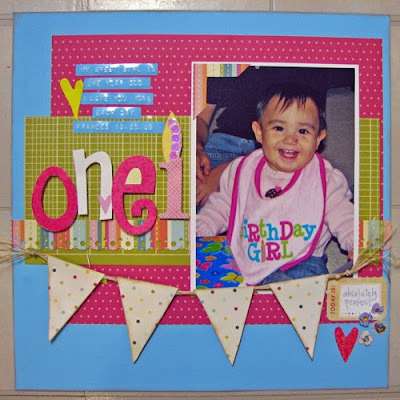 I tried to go easy on the embellishments on this layout too to keep the attention on the extra cute birthday girl. I also used one of the March sketch's from Scrapbook Challenges for a little inspiration. 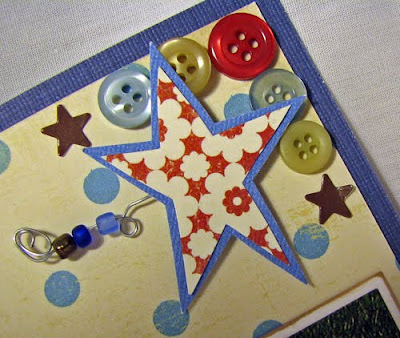 Just a little card to post today. 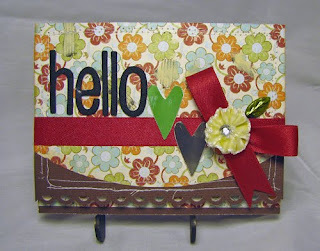 I created this hello card for the Lily Bee DT call using one of the past kits from Simply Obsessed. I actually created quite a few layouts the last few weeks, but none that I can post just right now ;) ;). Here's Monday's sketch from Scrapbook Challenges. Isn't that banner adorable? Pamela has created another awesome sketch again this week! I will have this one done by the end of the week. But in the mean time you can check out the rest of the DT's layouts here. It's reveal time at Simply Obsessed! Every month I say this is the best kit yet. And yep, I am going to say it again this month :). 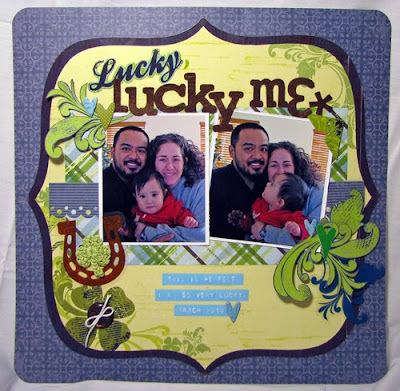 The March Lucky Me kit is just so fun! Even my husband commented on my projects and said how much he liked the colors. I would never pick out these colors on my own. I always go for pinks and reds. Good thing I have Heather, because I love the projects I created with this kit. That's just one of the reasons I love the kits at SO so much. I find so many great products that I would have otherwise overlooked if not for the kit. Plus the kits are always jam packed with amazing products! My first layout is of my husband, my daughter and I. We were fooling around with the self timer on the camera and took these goofy pics. 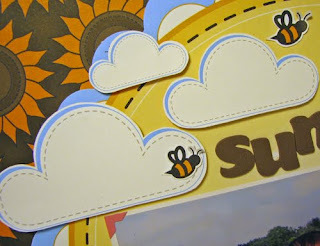 I cut out the swirls on the patterned paper to make embellishments and used some chipboard and thickers from my stash. All right, I'll admit it. I couldn't resist adding some pink to this layout. I don't like it when people think Frances is a boy so I thought a little pink would solve that. Aren't those prima roses the cutest? I wanted to use them as is because I thought they looked so cute like that. I tied them with a pink ribbon to make a rose bouquet. 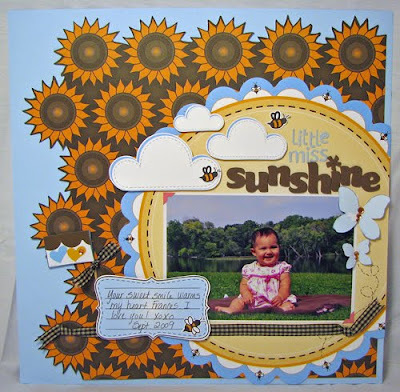 I usually don't like making cards, but I love the cards I made with this kit. I tied some raffia around each to give them fun dimension and used the cool Jillibean soup buttons. There's lots going on in March! The Simply Obsessed reveals of the March kit Lucky Me began on Monday as well. 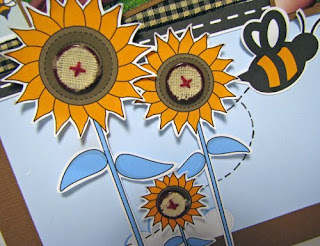 You can check out the DT's work with the kit here. Check back on Thursday for my reveal. 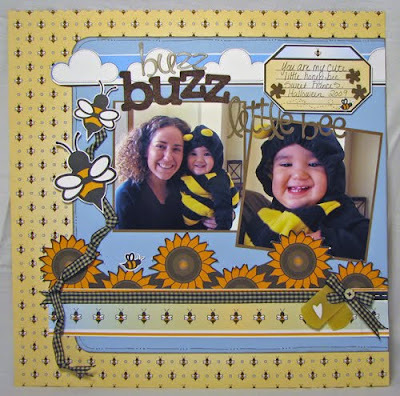 On March 11th I am hosting the Layout challenge at Simply Obsessed blog. 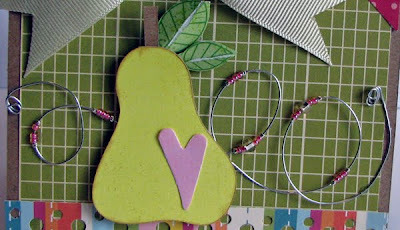 On March 15th I will be giving a tutorial on the Scrapbook challenges site on working with wire and beads. 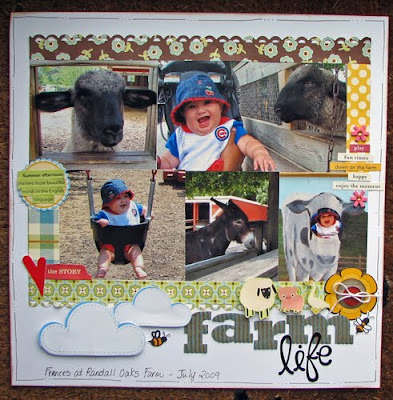 March is my guest design month for Nikki Sivils, Scrapbooker! I made the cutest lo's with her Willow Bee line. It is so so so so cute. 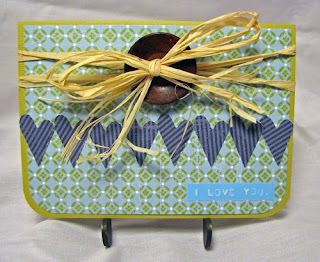 I think they will be posted on the Nikki Sivils blog on March 15th, but I will let you know when I see them! I hope your March is starting out great!